With a name like Hotel EMC2, you'd expect fun scientific amenities like a restaurant named the Albert or microscopes-turned-lamps in the rooms. However, Chicago's Hotel EMC2 offers guests something even better -- robots. Meet Cleo and Leo, two robots that cater to guests who might need assistance. They can bring an extra towel or bottle of water to rooms and even deliver room service that guests have ordered via a phone call or text message. To tell a guest they have arrived, a message flashes on the in-room television. Cleo and Leo look like trash bins on wheels but they make beeping noises like R2D2 from Star Wars and even a whooping sound when they open their lids to reveal whatever guests have ordered. While travelers inevitably forget a toothbrush or want to enjoy a meal in their room, many guests tend to find an excuse to see Cleo and Leo in action – and who can blame them? THE lift stops unexpectedly on the ninth floor. The door opens, and Cleo saunters in. She’s adorably cute. And a robot. 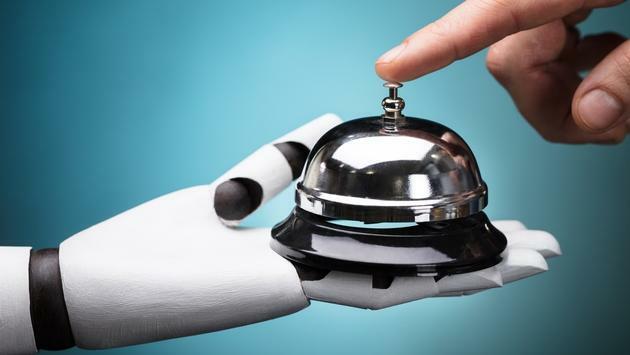 It's 2018, where hotel robots will meet your every need and that's something you don't want to miss.